Egyptian news agency MENA announced Tuesday the killing in the Sinai city of al-Arish of 13 men, suspected being militants, amid the ongoing army and security forces’ operation to weed out the Islamic State group (ISIS). 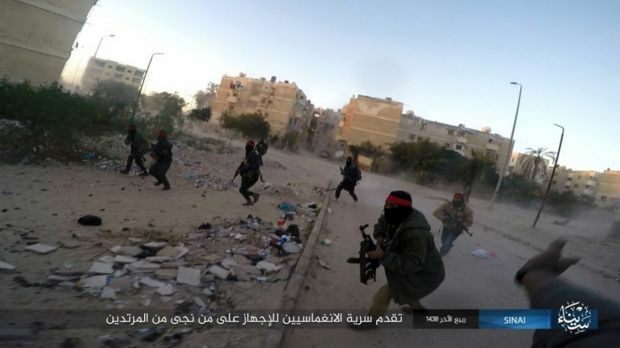 The men were killed in a gun battle with security forces who approached them in a house under construction in al-Arish; the capital of the North Sinai province, MENA said, adding the men were using the site as their hideout. President AbdelFattah al-Sisi in November gave go-ahead to an army and security operation meant to expel ISIS from the Peninsular following an attack on a mosque in a village in which over 300 people perished in November. Since it was launched in February, the operation, banned to independent and foreign media, killed 300 alleged militants, according to state figures. Death toll in the ranks of the army and security forces has been put at over 30. Eleven alleged militants were killed on July 11 in the same city in another shootout during a raid of a militants’ hideout. Three machine guns and a rifle were seized during the operation. MENA did not say whether any guns or ammunition were discovered during the Tuesday operation. Written by: Jaber Ali on July 25, 2018. Posted by Jaber Ali on Jul 25 2018. Filed under Headlines, World News. You can follow any responses to this entry through the RSS 2.0. Both comments and pings are currently closed.